We can only hope this incident won't spark the kind of media circus that surrounded the coyote in Toronto's Beaches neighbourhood in February and March. Neville, as that coyote came to be called, earned a death sentence – later reduced to life in a sanctuary when the Minister of Natural Resources issued a pardon – for the crime of failing to discriminate between a groundhog and a chihuahua. Articles about coyotes were rife with aggressive descriptors of a “brazen” coyote who was “stalking” innocent pets. Sensationalists warned that children were next. Neville's type are not a threat to people. There are only a handful of coyote attacks each year across North America. To put that in perspective, Toronto received reports of more than 600 dog-to-human bites in 2008. We are millions of times more likely to be injured by our own pets than by any wild animal. But as anyone with a phobia can tell you, our fears are not always proportional to reality. People begin to develop mental maps about animals early in life. From a young age, children know which animals live on the farm, in the forest, in the home. As we grow older, we develop a set of beliefs and behavioural codes for each group. These codes tell us, for example, that it is okay to eat farm animals, but not okay to eat pets. Wild animals are to be admired, watched and occasionally feared. Domestic animals are to be coddled, played with and treasured. Felis catus, which has an honoured place in a quarter of Canadian homes, should fit squarely in the category of domestic animal. Yet many people still think of domestic cats as semi-wild. As their owners attest, cats cannot be “mastered” in the same way as dogs: They can be fickle, aloof, and do not obey our commands. This may be why so many pet owners feel justified in allowing pet cats to wander the streets unsupervised. Is this why we let them take their chances against cars, predators and diseases? Is this why we turn a blind eye to the annual slaughter of billions of wild animals by free-roaming cats? Because we think cats still have the wild in them? It is time to end this categorical confusion. Cats are no more wild animals than hamsters are. If anything, they are less so: Today's pet-store hamsters descend from a wild cousin captured in the 1930s, whereas household cats have been molded by 4,000 years of domestication. No one would put a hamster outside to fend for itself. Cats need our protection too: Outdoors, they have a life expectancy of fewer than five years; indoors, they typically live 12 to 15 years. Cats themselves suffer the effects of our pseudo-mythologies about their wild natures, but they also exact a high cost in the ecosystems where we release them. Some outdoor cats kill 100 wild animals a year, and studies have found that cats kill a lot more animals than their owners are typically aware of. A cat catching only “the occasional bird,” as some owners report, is not as insignificant as it might seem. The impact of Canada's 5.5 million outdoor pet cats and our uncounted number of feral cats reaches far beyond our backyards, deep into the ecosystems that support human life. But our hostile reaction to coyotes preying on them betrays a double confusion of the categories into which we sort our animals. the Wild: A Hotline Operator's Guide to Helping People and Wildlife. Would a bell have stopped Sylvester from chasing Tweety? And you probably don't have much chance of discouraging your own putty tat from going after the birds at the neighbour's feeder either, says Erin Luther of the Toronto Wildlife Centre. Luther is project coordinator for a public education campaign launched this summer that is aimed at persuading cat owners to keep their animals inside or contained in the backyard. Domestic cats are savaging the North American songbird population, with some U.S. estimates suggesting cats kill 1 billion birds a year. Too many cat lovers mistakenly believe their animals are innocent bystanders in the slaughter, said Luther. There's no evidence other birds or small mammals associate bells with predators and many cats can learn to move silently in spite of a bell on their collars, she said. But even cat owners that don't care about birds and small mammals should be thinking about the safety of their pets, said Luther. "It is the responsibility of pet owners to make sure their animals and others are safe," she said. "It's a lose-lose situation if cats go outdoors." Studies show that outdoor cats' life expectancy is less than five years, compared with 15 to 17 years for indoor cats. The Toronto Wildlife Centre at Downsview Park is leading the campaign, which is focused online at keepanimalssafe.ca. Staff and volunteers have also been circulating information in the Beach, where coyote concerns have some cat and small-dog owners worried. Luther advises cat owners to buy or build a cat enclosure for their backyards, train their cat to a harness and leash or simply keep the pet indoors. The education campaign is being funded by a $70,000 grant from the Ontario Trillium Foundation. A website, www.keepanimalssafe.ca, has been designed to stamp out some of the myths regarding cats, says Nathalie Karvonen, director and founder of the wildlife centre. Q: Why did the Toronto Wildlife Centre decide to take on this particular project? A: The issue of cats and birds comes up on the centre's hotline all the time, usually many times a day during the spring and summer when many birds are on the ground. Some birds spend five to 10 days on the ground before they can fly. Q: How many birds and animals does the average cat kill? A: Some studies show that cats kill about 100 animals a year. "If we were able to convince 50 people to keep their cats inside and each of those animals was killing 100 animals a year, that's 5,000 animals. That's how many we treat in a year," Luther said. Q: Why do domestic cats hunt and do they usually eat what they kill? A: "All sorts of studies show it doesn't matter how well fed a cat is. It will still do just as much hunting as a cat that's looking for food," said Luther. "The urge to hunt and the urge to eat are controlled by different parts of the brain in cats. The species of cat that we have as our pet cats we've been domesticating now for over 4,000 years, so they're really dependent on people. And they've still got this hunting instinct, a sort of behavioural relic. But it's not really necessary for their survival." 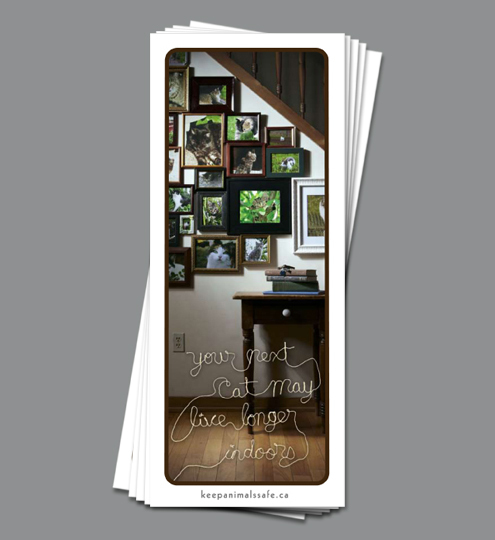 Housecats are leaving an indelible imprint on Toronto’s ecosystem, but it’s not a purrfect one. Kicking off its Keep Animals Safe campaign in the Beach, the Toronto Wildlife Centre is educating the public on the damage domestic cats cause in the great outdoors. centre. “In a wild ecosystem, once the population level of that sparrow goes down, the predators start being affected as well. It’s Toronto Wildlife’s first venture into the public education spotlight and its hope is to illustrate just how fragile the city’s ecosystem is. Those meowing about keeping their cats indoors 24/7 do have another option: enclosures. kitties their outside time without allowing them to run free through the neighbourhood. Her company, Habitat Haven, builds sturdy, outdoor pads for pets that attach to pet owners’ homes. “It keeps cats away from the wildlife so you won’t have the baby birds being maimed,” she said. Kischer connected with Toronto Wildlife by donating a cat enclosure every year to the centre’s annual ball. buildings. Felines can come and go as they please through a cat door placed in a window of the house. “All we do is put a Plexiglas sleeve with a cat door where the screen normally is — so again your window is not damaged in any degree — and when you don’t want the cats to go out, you just close your window,” Kischer said. It’s not just for cats, either. Some clients use them for dogs, tortoises and rabbits. Kischer said it could have saved the life of a chihuahua that was attacked by the now infamous Neville Park coyote. A recent study out of Arizona noted 42 percent of coyotes’ diets were housecats, Luther said. 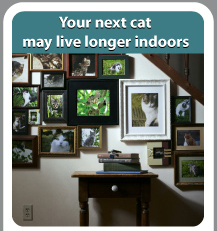 Toronto Wildlife Centre and the Canadian Cats Indoors Alliance is launching the “The Keep Animals Safe” campaign to encourage residents of Toronto’s Beaches neighbourhood to keep pet cats indoors or in protected outdoor enclosures. 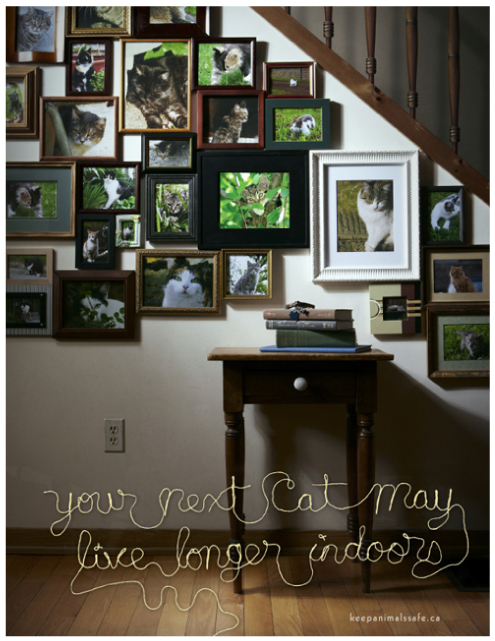 Transit ads and posters created pro bono by Agency 59, feature a living room wall covered in framed photos of the family’s pet cats. The onslaught of photos is meant to represent the short lifespan of free-roaming outdoor cats. According to the Toronto Wildlife Centre, an indoor cat lives an average of 10 years longer than its outdoor counterpart. The campaign attempts to raise awareness about the dangers faced by free-roaming pet cats including cars, human cruelty, debilitating diseases and exposure to poisonous chemicals. The creative drives consumers to KeepAnimalsSafe.ca, an information portal built pro bono by Off The Cuff Marketing. Visitors to the site can find answers to frequently asked questions about indoor and outdoor cats, tips to help transition cats to the indoors, and safe alternatives to letting cats roam unsupervised outdoors. (TORONTO: June 15, 2009) – Toronto Wildlife Centre and the Canadian Cats Indoors Alliance are launching an education campaign with a focus in the Beach area in Toronto to raise awareness about the dangers faced by free-roaming pet cats, and to encourage residents to take action to keep animals safe by keeping pet cats indoors or in protected outdoor enclosures. The campaign kicks off Monday, June 22, 2009 at 11am with a launch in Kew Gardens on Queen St. East in the Beach. Residents are welcome to stop by between 11am-1pm and check out a portable outdoor cat enclosure—a safe alternative for outdoor pets—as well as catch a first glimpse of a visual that Beach-goers will soon be familiar with: the campaign ad, created by Agency 59, takes a sobering look at the too-short lifespan of free-roaming outdoor cats—an average of 10 years shorter than their indoor counterparts. The ad will be appearing over the summer in TTC vehicles and stations, and posted in windows of businesses, community centres and libraries throughout the Beach area. A new website has also been launched—www.keepanimalssafe.ca—which includes more information about the issue, answers to frequently asked questions about indoor and outdoor cats, useful tips to help you transition cats to the indoors, as well as safe alternatives to letting cats roam unsupervised outdoors. Free-roaming outdoor cats face many dangers including cars, human cruelty, debilitating diseases, exposure to poisonous chemicals and—as recent events with the Neville Park coyote will testify—predation by other animals. Outdoor cats also have a devastating effect on wildlife, particularly during the spring and summer when wild animals are nesting and raising young. Young birds and mammals who are not yet fully mobile, such as fledgling songbirds and ground-nesting cottontail rabbits, are easy targets for cats. Since cats are a domesticated species which is not a part of wild ecosystems, the impact of them killing animals in these delicately balanced systems is significant. The scope can be difficult to appreciate—though most cat owners may only be aware of a few animals caught by their cats, current research estimates that outdoor cats collectively kill more than a billion wild animals every year in North America alone. To learn more about the issue and what you can do to help, check out www.keepanimalssafe.ca. The Keep Animals Safe campaign is made possible through the generous support of the Ontario Trillium Foundation. The Ontario Trillium Foundation is an agency of the Government of Ontario. The Foundation provides grants to a variety of charitable and not-for-profit organizations working in the fields of arts and culture, sports and recreation, the environment as well as human and social services. For more information on the Ontario Trillium Foundation, please visit their website at trilliumfoundation.org. Toronto Wildlife Centre would like to acknowledge the pro-bono contributions of Agency 59 in ad design, The Kenilworth House in media relations, and Off The Cuff Marketing in web development and hosting. Toronto Wildlife Centre would also like to thank the members of the Canadian Cats Indoors Alliance (CCIA), who have partnered in support of keeping animals safe. For media inquiries, please contact Erin Luther at erin@torontowildlifecentre.com, or (416) 631-0662 x3210. Show your support for the Keep Animals Safe Campaign. Download a PDF (3.5MB) copy of the media poster here.